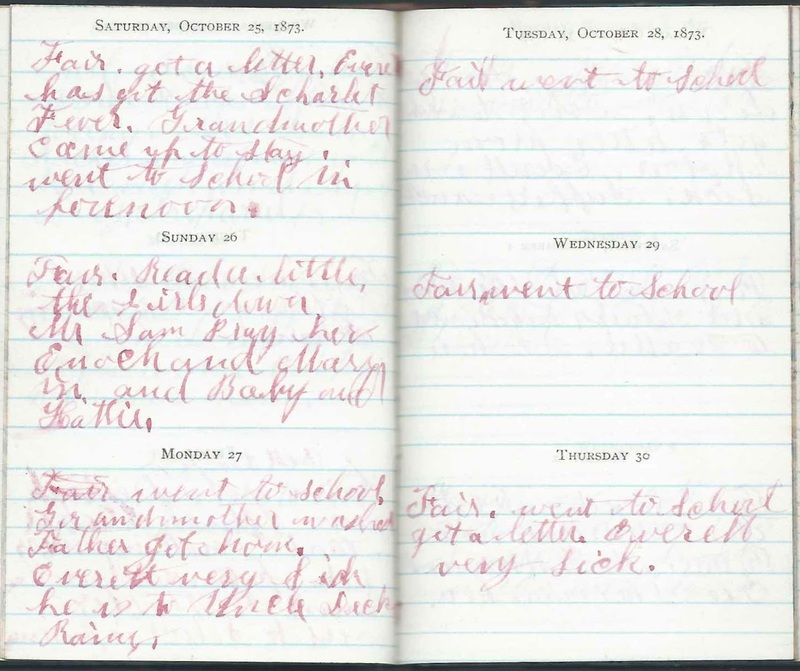 October entries in the 1873 diary of Ida Isadore Reynolds (1860-1946) of Acton, Maine. Ida would marry John Jotham Shapleigh (1856-1923) in 1881. Links to the months of September 1873 and November 1873 appear here and at the end of this post. Wednesday, October 1, 1873: Fair. Picked our Peas. Finished Husking corn. Mother went to Hubard Stephen's. Mr. Hilton. I went to Hattie's. She here. Thursday, October 2, 1873: Fair. Went to the Falls. Went to see Addie, to Nell's. Hubbard's to Mr. Hargraves to see Hannah. Got me a box of elastics, roll of ribbon. Friday, October 3, 1873: Fair. Went with Hattie. Saturday, October 4, 1873: Fair. Baked. Went to Hattie. Sunday, October 5, 1873: Fair and Showers. Went to George Prescott's. Hattie and George Hilton here. 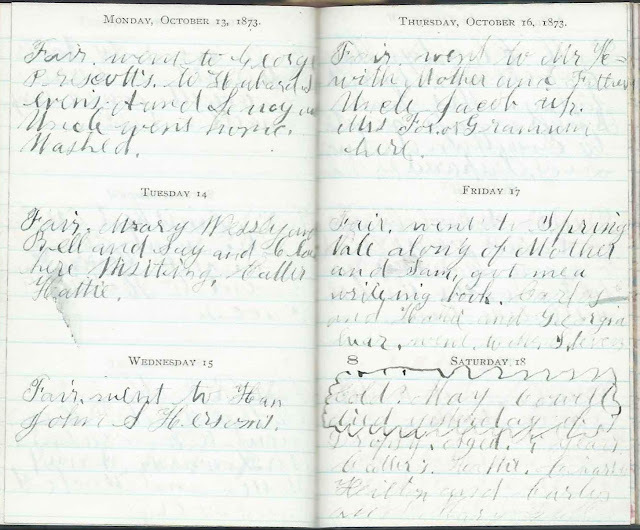 Monday, October 6, 1873: Fair but a Rainy evening. 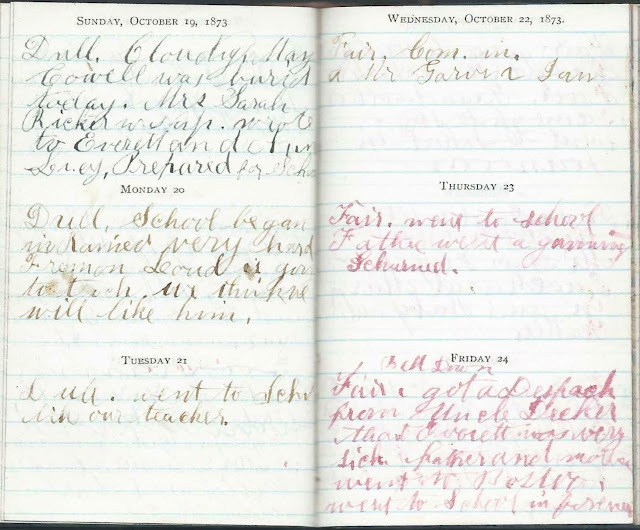 Tuesday, October 7, 1873: Fair [crossed out]. Some cold. Very Rainy day. Wednesday, October 8, 1873: Fair. Made ___ 3 Vests. Went to Hattie's. 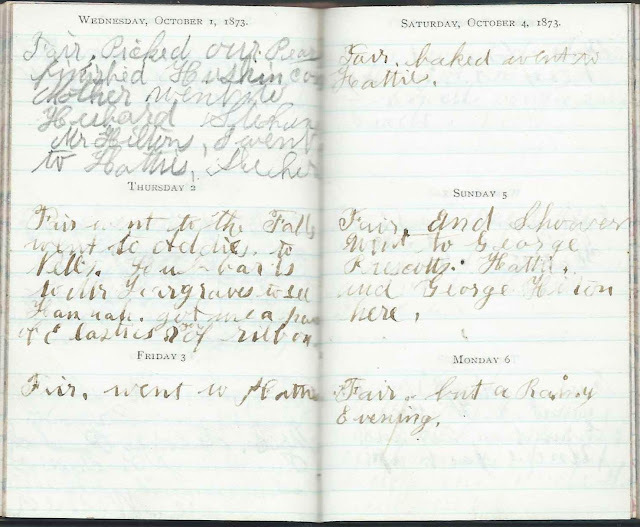 Thursday, October 9, 1873: Fair. Made 3 vests. Went to Hattie's. Grand mother and Uncle Jacob up. 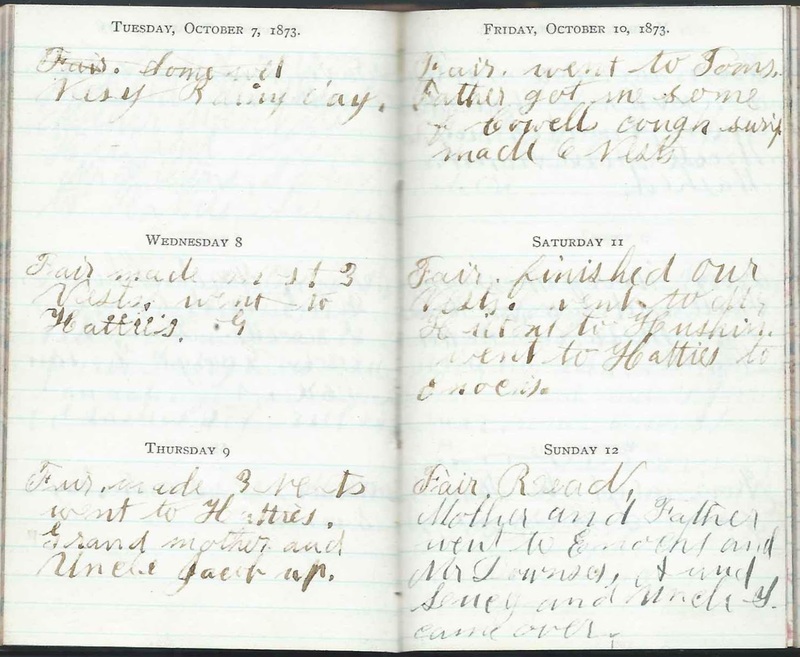 Friday, October 10, 1873: Fair. Went to Tom's. Father got me some of Cowell's cough syrup. Made 6 vests. Saturday, October 11, 1873: Fair. Finished our vests. Went to Mr. Hilton's to Husking. Went to Hattie's to Enoch's. Sunday, October 12, 1873: Fair. Read. Mother and Father went to Enoch's and Mr. Downes'. Aunt Lucy and Uncle S. came over. Monday, October 13, 1873: Fair. Went to George Prescott's. 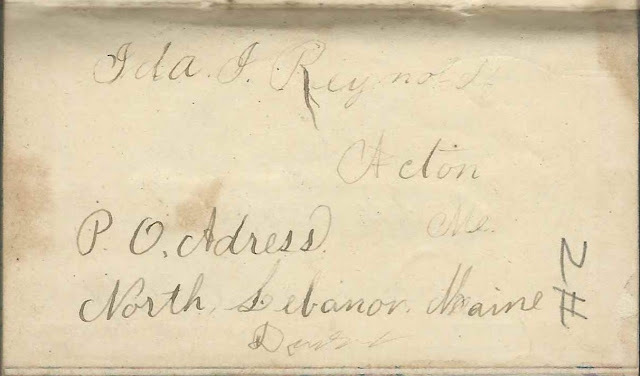 to Hubbard Stevens' Aunt Lucy and Uncle went home. Washed. 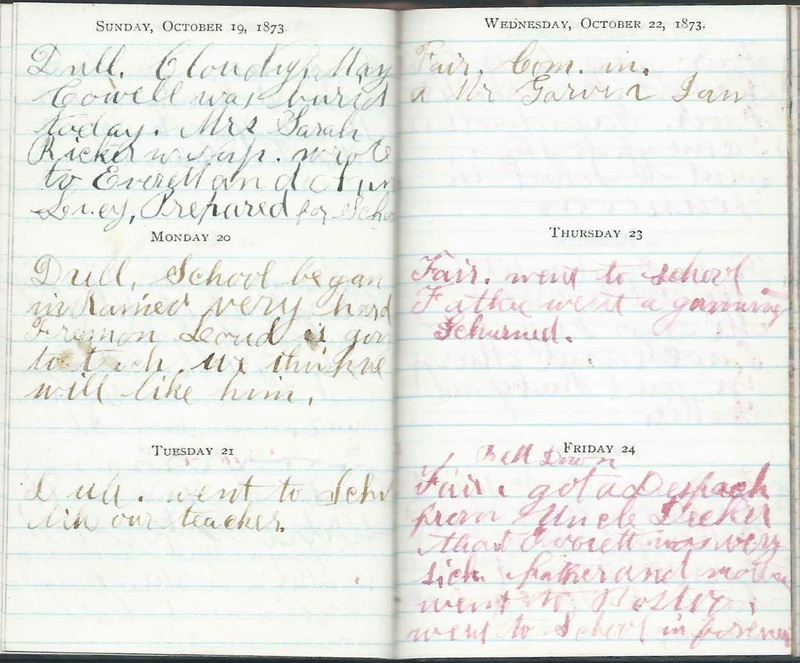 Tuesday, October 14, 1873: Fair. Mary, Wessly [Wesley ?] and Bell and Say and Clara here Visiting. Caller, Hattie. Wednesday, October 15, 1873: Fair. Went to Han [Hannah ? ]; John S. Hersom's. Thursday, October 16, 1873: Fair. Went to Mr. ? with Mother and Father. Uncle Jacob up. Mrs. Fox or Grammon here. 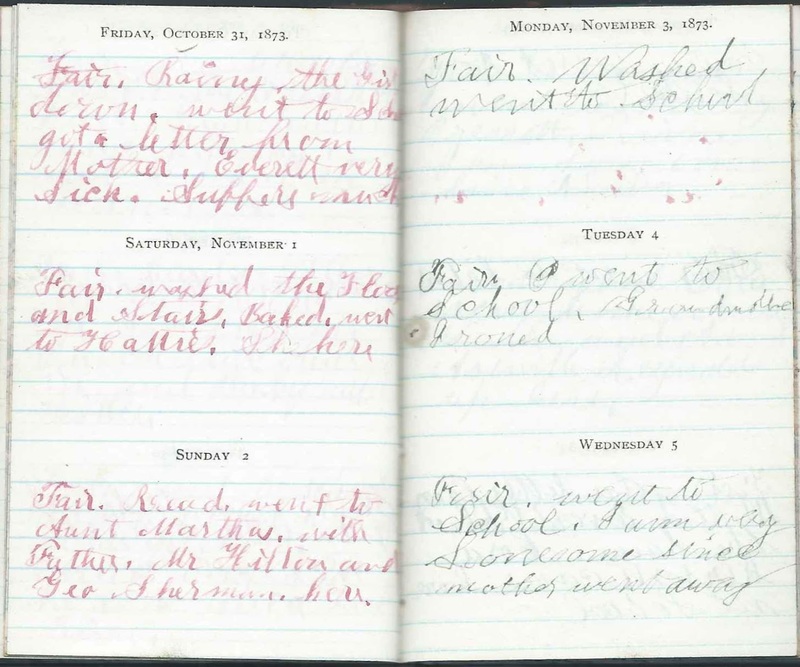 Friday, October 17, 1873: Fair. Went to SpringVale along of Mother and Sam, got me a writing book. Carlos and Hattie and Georgia here. Went to Mr. Stevens'. Saturday, October 18, 1873: Cold. May Cowell died yesterday of Dropsy. Aged 5 years. 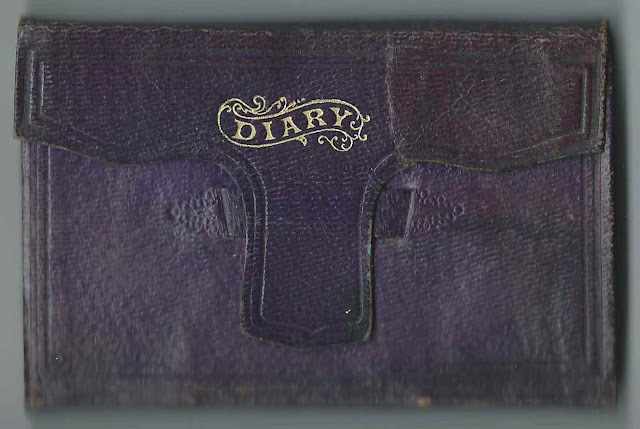 [Ida marked this information in a scalloped box.] Callers, Hattie, ? Hilton and Carlos all here. Sunday, October 19, 1873: Dull. Cloudy. May Cowell was buried today. Mrs. Sarah Ricker was up. Wrote to Everett and Aunt Lucy. Prepared for School. 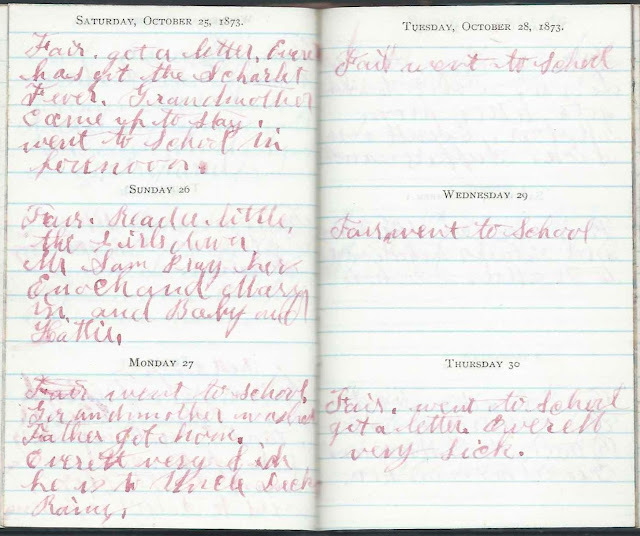 Monday, October 20, 1873: Dull. School began in Rained very hard. Freeman Lowd is going to teach. We think we will like him. 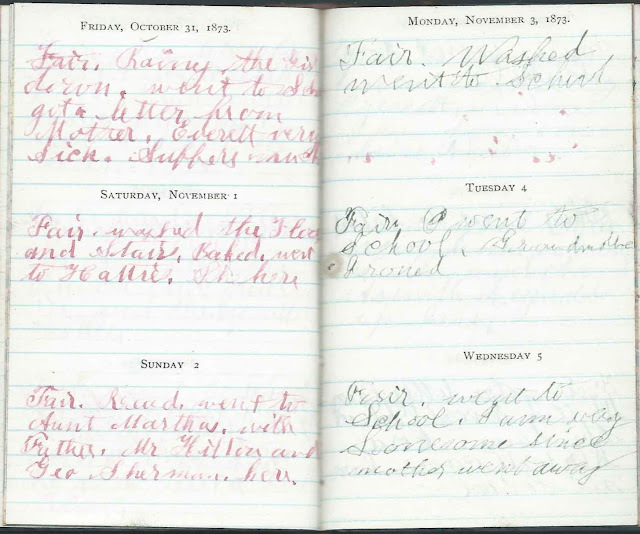 Thursday, October 21, 1873. Dull. Went to School. Like our teacher. Wednesday, October 22, 1873: Fair. Com. [Commissioner ?] in. a Mr. Garvin Jun. Thursday, October 23, 1873: Fair. Went to School. Father went went a-___. Churned. Friday, October 24, 1873: Bell Down. Fair. Got a Dispatch from Uncle Decker that Everett was very sick. Father and Mother went to Boston. Went to School in forenoon. Saturday, October 25, 1873: Fair. Got a letter. Everett has got the Scarlet Fever. Grandmother came up today. Went to school in forenoon. Sunday, October 26, 1873: Fair. Read a little. The girls down. Mr. Sam Pray here. Enoch and Mary in and Baby and Hattie. Monday, October 27, 1873: Fair. Went to school. Grandmother ___. Father got home. Everett very Sick. He is to Uncle Decker's. Rainy. Tuesday, October 28, 1873: Fair. Went to School. Wednesday, October 29, 1873: Fair. Went to School. Thursday, October 30, 1873: Fair. Went to School. Got a letter. Everett very sick. Friday, October 31, 1873: Fair. Rainy. The girls down. Went to School. Got a letter from Mother. Everett very sick. Suffers much. Saturday, November 1, 1873: Fair. Washed the Floor and Stairs. Baked. Went to Hattie's. She here. Sunday, November 2, 1873: Fair. Read. Went to Aunt Martha's with Father. Mr. Hilton and George Sherman here. Monday, November 3, 1873: Fair. Washed. Went to School. Tuesday, November 4, 1873: Fair. I went to School. Grandmother ironed. Wednesday, November 5, 1873: Fair. Went to School. I am very lonesome since mother went away. Mr. Hilton - presumably Andrew Hilton (1810-1873), husband of Eliza Ann (Paul) Hilton (1816-1891); Andrew would die in December of 1873 while traveling to Middleton, New Hampshire, where his brother James had just died. "Mr. Hargraves to see Hannah" - Hannah may have been Hannah Francis (1854-1923), daughter of Dr. Daniel Francis (1810-1867) and Christie Ann (Tupper) Francis (-1893), who was a sister to Ida's mother Rachel E. (Tupper) Reynolds (1833-1923); also known as Annie; she would marry James Alexander Buchanan (1850-1906). Tom - presumably Thomas Sherman (1823-1893), husband of Abigail Elizabeth (Fox) Sherman (1822-1877) and father of Ida's friend Harriet Eldora Sherman (1859-1937), "Hattie"
Sam - Samuel Muir Francis (1858-1928), son of Dr. Daniel Francis (1810-1867) and wife Christie Ann (Tupper) Francis (-1893), who was a sister to Ida's mother Rachel E. (Tupper) Reynolds (1833-1923). Samuel may have been the Sam or Sammy mentioned often in Ida's notebook and apparently living with the family at times. Lucy May Cowell (1866-1873), daughter of Edmond Eustace Cowell (1825-1899) and Elizabeth Jane (Chamberlain) Cowell (1830-1923), "Jane". If you have corrections to anything above, or information to share on any of the people mentioned, please leave a comment or contact me directly. Advance to November 1873 or return to September 1873.